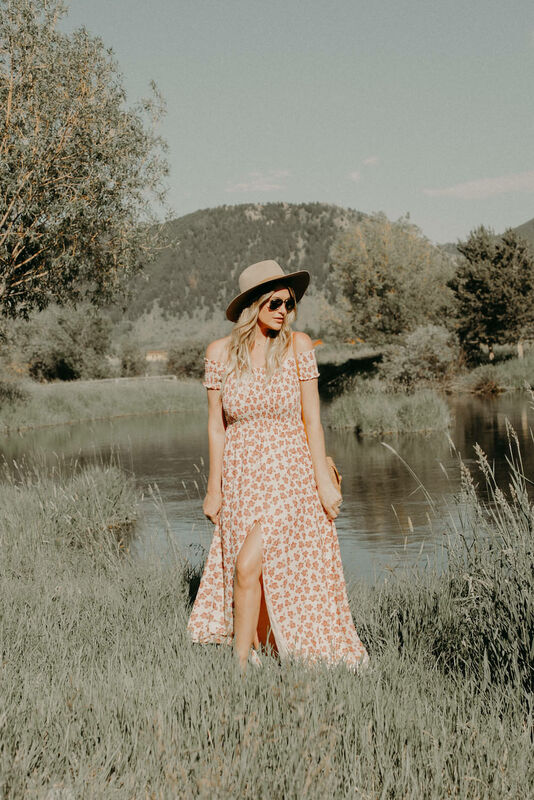 I recently had the incredible opportunity to escape to the mountains in Jackson Hole, Wyoming on a press trip and I had the absolute best time, you guys! Jackson is my happy place. You might remember my previous visits to Jackson Hole, Wyoming here and here. I just can't get enough of this picturesque town perfectly nestled beneath the breathtaking Teton mountains. Mountain Modern Motel, or MMM as I came to call it, is the newest addition to Jackson Hole, Wyoming and is totally plaid-to-the-bone. Not your typical "motel," this cool, revolutionary property is über chic and modern with a bit of frontier flair. I died when I checked into my cheeky, minimally modern room. Adorned with the best buffalo plaid blanket (which they also have for sale and I ended up bringing one home with me), and a fun word-search chalkboard, my first thought was that their rustic-mountain branding was on-point! I felt right at home. And don't get my started on how cozy and airy my room was! I fell asleep on my comfortable bed the moment my head hit the pillow every night - like sleeping on a cloud. And I loved how creative they were with the space, making the bathroom also function as a kitchen. Their vibe really jived with that of Jackson Hole, Wyoming... very laid back yet thoughtfully designed. They really paid close attention to detail and it's the little things like that in a getaway destination that make all the difference. 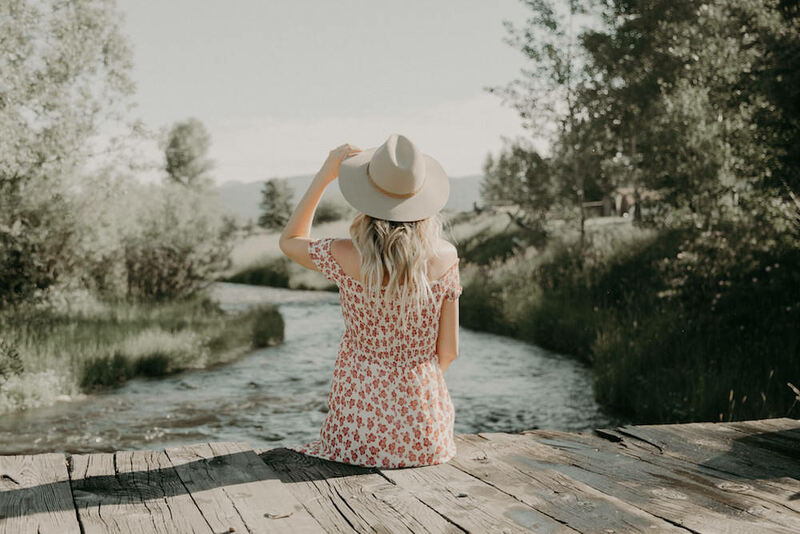 Located in the heart of Jackson Hole, Wyoming, MMM is just steps from the charming town square (think: those iconic elk antler arches (which the elk shed naturally every year)). 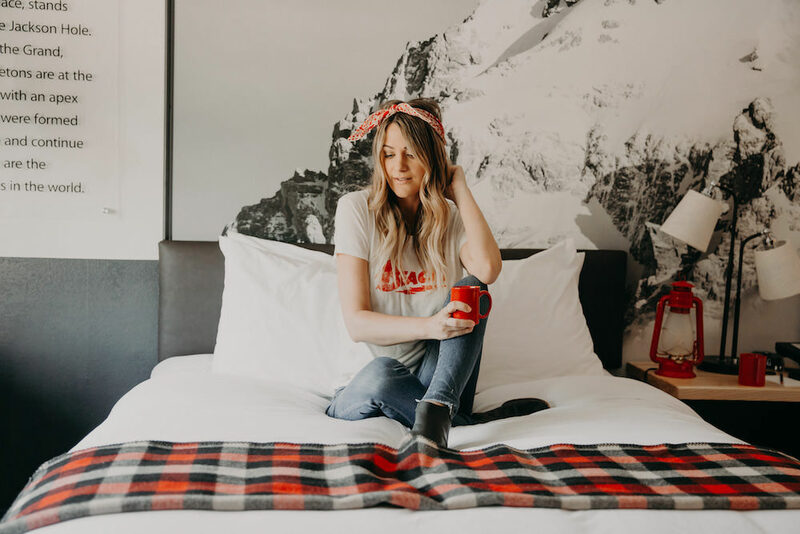 It's the perfect basecamp for adventuring in the mountains, hitting the slopes or exploring (and eating or shopping) your way through town. I remember saying to my friend Sydne that it would be the perfect destination for a group getaway. Ben had his bachelor party in Jackson (adventures in river rafting, hiking, fishing and drinks at the iconic Million Dollar Cowboy Bar) and it would have been the perfect spot for them to stay! Adventure awaits just outside the front door. MMM is the perfect new addition to Jackson and I am so glad I had the chance to stay here and experience all that they have to offer - from attentive customer service (they were there in two seconds flat to help me, the pregnant lady, carry my heavy bag to and from the car) to the convenience of walking straight to your room from the street with its unique open floor plan. I can't wait to visit when I come back. Use Promo Code CAITLIN to get 30% off your stay at MMM in Jackson Hole, Wyoming through July 31, 2017! Our first stop of the trip? A winery, of course! It was a bummer that I wasn't able to partake in the fun this time - but the property views alone were well worth the trip! 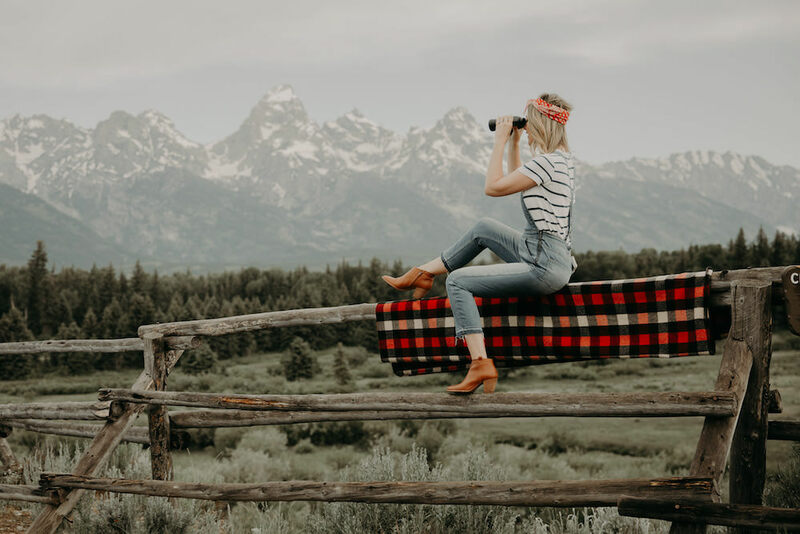 Located next to Spring Creek in Jackson with beautiful views of the Teton mountains, it was the perfect setting to sip a glass of wine that was produced and cellared at 6,229 feet above sea level. It was also neat to have the chance to get to know the family behind the winery and see how they bottle and cork their distinctive wines. Jenny Lake is one of my favorite spots to visit in Jackson (last seen here). Situated within the beautiful Grand Teton National Park, the lake provides outstanding hikes along creeks to waterfalls and through canyons and makes for a scenic boat ride to take in its awe-inpsiring beauty. One of my favorite summertime activities in Jackson is to go for a hike. This trip, we hiked around String Lake, which I had never done before, and it was so peaceful and picturesque. The 3.8-mile loop begins from the String Lake Trailhead and provides outstanding views of 13,770-foot-tall Grand Teton. Also, the small wetland area on the northwest side of the lake is prime moose habitat. So pack a picnic and head here for some epic views and adventures. Another one of my favorite hikes is the short 1.3-mile loop to Hidden Falls. From the Jenny Lake Trailhead you hike over Cascade Canyon Creek to reach the impressive Hidden Falls. Altitude: Every time I visit I always make a pit stop into Altitude (I picked up these a-line overalls). Nest: I love popping into Nest to check out their cute collection of hats and beach totes in the summertime. Made: If you're looking for unique gifts to bring home to friends and family, definitely stop into Made. Mountain Dandy: For unique decor, apothecary and vintage finds, pop into Mountain Dandy. Stio: For outdoor apparel, I love checking out Stio. They have a great selection of rain coats, which can be perfect for the fickle afternoon Wyoming weather. Last time I was in Jackson was over Christmas and I spent half my time just driving around looking for animals. 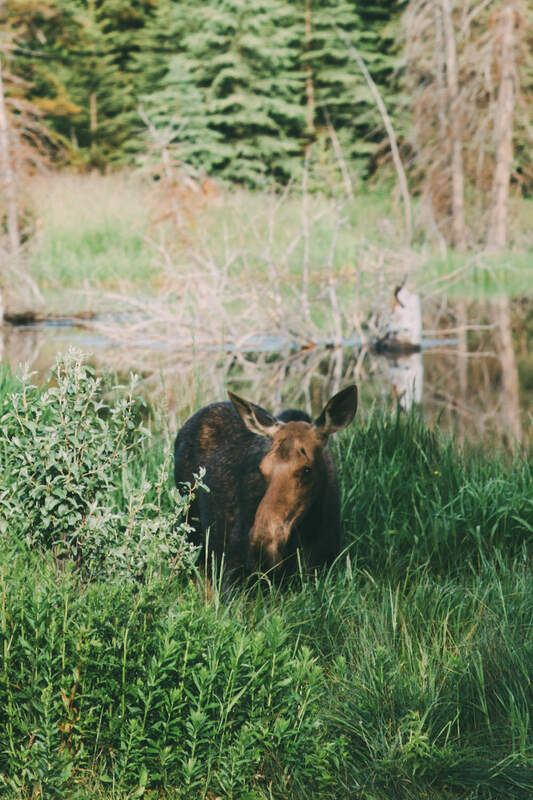 Pretty much anywhere you turn you're bound to run into some wildlife - from the wandering elk to roaming bison - there's wild creatures a-plenty. But one thing I have never seen in all my visits is a bear! So this trip it was my mission. And Jackson Hole Wildlife Animal Safari's delivered, you guys! Ahhh! Quite possibly the highlight of my trip was seeing this mama grizzly (named "399") and her two cubs cross the road merely yards in front of us. Such a cool experience for sure! I called my parents immediately to brag, haha, because they too haven't been so lucky as to see bears (let alone with their babies). The rodeo has been a part of the Jackson Hole cowboys culture for over one hundred years. It's fun to experience the legendary rodeo, which run every Wednesday and Saturday from Memorial Weekend through Labor Day. Head to Jackson Hole resort for the adventure of a lifetime at their newly opened Via Ferrata. Basically you can cross suspended bridges, scale granite walls and climb high above the valley floor with a guide. Sadly, I wasn't able to participate in this super fun activity since I am twenty-three weeks pregnant, but the next time I am able I am definitely going to be checking out this cool new adventure. It's perfect for families, groups or individuals. Rendezvous Bistro: This was my first time visiting this local favorite, but oh my gosh, it was so good! Whatever you do, definitely get the mac-and-cheese, fried calamari and chipotle corn when you visit Rendezvous Bistro. Lotus: Basically a wellness center disguised as a restaurant, Lotus serves yummy breakfast, lunch and dinner and well as smoothies and cold-pressed juices. If "healthy" isn't your thing, don't worry, they have the best nachos in town! Persephone Bakery: Hands-down Persephone's is my favorite breakfast spot in Jackson. Seriously, don't miss it. You'll regret it. Hatch: Looking for tacos (and tequila)? Head to Hatch and get the carne asada. Piste: If you want dinner with a view, take the gondola up Jackson Hole Resort to Piste. I had the chicken and it was seriously delicious. Local: Looking for some meat? I love hitting Local for happy hour. Il Villaggio Osteria: Looking for Italian, Il Villaggio Osteria in Teton Village is your spot. Thank you to my friend Sydne for snapping these photos of me along the way throughout our trip, and thank you to Mountain Modern Motel for hosting me on such a memorable vacation. 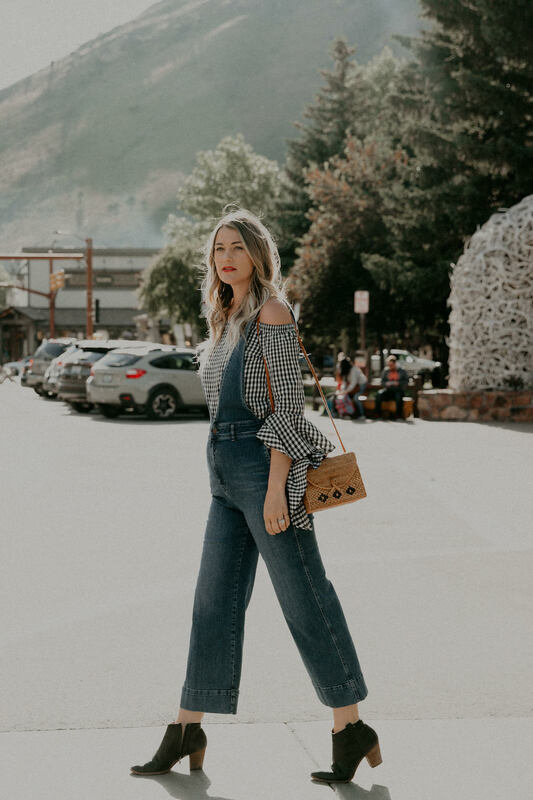 Those overalls are extra cute! Love all the cute outfits! Especially the last one with the overalls and striped tee!! My fave! This hotel has my name all over it! Love your photos and recommendations! Oh… I’m living through your posts and your travels. LOVE all of the photos and your outfits! Stunning photos – love the hats! !